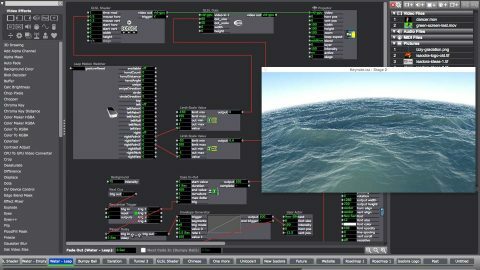 Isadora’s creator and pioneering media artist MarkConiglio will offer a two-day introductory workshop to Isadora – a software tool expressly designed to be used by artists that offers real-time interactive control of video in a way that goes beyond standard VJ software. During the first day, Coniglio will quickly cover the basics of importing, playing and layering media and show how to use the integrated projection mapping tool. The second day will be spent showing how to take interactive control of your media using MIDI devices and other sensors. Participants will all receive a free three-month license for the full version of Isadora so that they can continue to experiment with the program after the workshop ends. Participants will need to bring a personal computer (Mac or PC). If you have a MIDI device like a Launchpad or Nanokontrol, please bring it along and so we can show you how to use it for real-time control. LPM 2018 Rome begins on June 7, 2018 in the spaces of EX Mattatoio. Learning activities will take place in the dedicated classrooms every day starting from 15.00. Read carefully the requirements to attend the classes, choose your activity and register! Workshops are dedicated to learning and sharing, drawing upon the themes of Video Mapping, interactive interfaces using open software and different devices, generative visual with sound and scripts, but also with market leader of veejay software. Hurry up to register since places are limited! We remind you that the call to participate to LPM 2018 ROME is still open! Registration form is only available on-line and the subscriptions will be accepted until April 18, 2018!